First City Monument Bank Limited is set to provide funding to the Tractor Owners & Hiring Facilities Association of Nigeria (TOHFAN) for the acquisition of 100 tractors to boost agricultural production this year. Balogun said that the Bank will intensify its support to the agricultural sector and its value chain in order to fast-track the growth of the Nigerian economy. Speaking at the press conference, Chairman of TOHFAN, Alhaji Danladi Garba, commended FCMB for its support to the agric sector and farmers. He said, FCMB in 2014 supported the group with N120 million for the acquisition of tractors which have been distributed to farmers in Kaduna state. 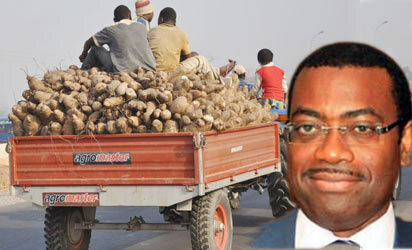 He said for the 2015 farming season, TOHFAN have applied to FCMB for credit facility to acquire 100 tractors. “And by the time these tractors are released, 52,510 farmers will have access to tractor services and the expected net revenue to be generated to these beneficiaries is N188 million,” he said. Speaking further, Balogun reiterated FCMB’s commitment to supporting the agricultural sector. He said: “The bank is focused on being a strategic partner to the government and other stakeholders in the agric sector to ensure food sufficiency, employment and revenue generation, in line with its value as a helpful financial institution. We have been providing various lines of credit to the sector and its value chain, including small and medium scale businesses. This funding has been on the rise and we are determined to grow it to 21 percent within the next three years as against nine percent in 2014”. He said in addition to the support to NOHFAN, FCMB has also collaborated with Doreo Partners to launch a support programme for farmers, known as Baban Gona (or ‘’great farm”). This is an agricultural franchise model, where farmers are trained and offered loans to carry out their farming activities.